Choosing the right material is as important as investing in insulating our buildings in the first place – there is little point doing it if the insulation can’t offer good enough performance to really make a difference, or isn’t going to be up to the job in the long term. Specifiers need to understand the differences if they are to make an informed choice about which insulation material to use in order to do the job they want and get a good return on their investment. Climate change is one of the major industrial challenges of our time. Business, science, politics and industry are being called upon to slow down any further rise in greenhouse gas emissions and use available resources more efficiently. It is clear to everyone today that there is a finite limit to fossil fuel sources. Natural gas has recently become a focus of speculation. Faced with these facts, various concepts and strategies for sustainable protection of the environment and climate, for the future, have been put forward. A key approach is improving thermal Atlanta insulation in buildings. A concern for property owners is energy conservation measures and the costs entailed. The technologies and materials required have been available for some time and can be very cost effective. In many cases, investing in thermal insulation measures pays for itself in less than ten years, and in many countries grants and attractive loans are being given. Get on board! New and old buildings are today and will be in the future very largely subject to energy saving and environmental protection requirements. The focus here is on thermal insulation and sealing of buildings and roofs. From a structural point of view, roofs are the most exposed parts of a building. They have to withstand heat and cold, wet and dry conditions, storms and snow, and even decades later still be water-tight and provide reliable thermal insulation. 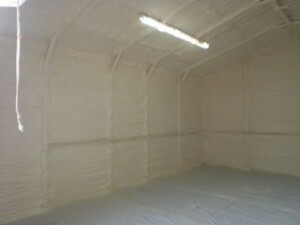 Atlanta spray foam represents up-to-date, environmentally- and energy-aware and economic insulation. Atlanta spray foam insulation acts to seek and seal all the air gaps in a building during the installation to achieve Best Practice air leakage values. No extra measures are needed meaning a very cost effective solution to dramatically reducing carbon emissions and improving comfort factors. Air Permeability results of 3m³/h/m²@50Pa have been achieved after installing the insulation in buildings constructed from Brick and Block or buildings having Timber Frames. The Kyoto Protocol has put pressure on the industrialized countries to reduce emissions of greenhouse gases. According to the EU directive, energy certification aims to create incentives to carry out renovation measures. It gives information on the energy rating of buildings and is intended to be given to potential buyers or people renting property for construction, purchase.